School exclusions for autistic children are on the rise. We need your help in making some noise about an issue which affects so many autistic children and is only getting worse: school exclusions. 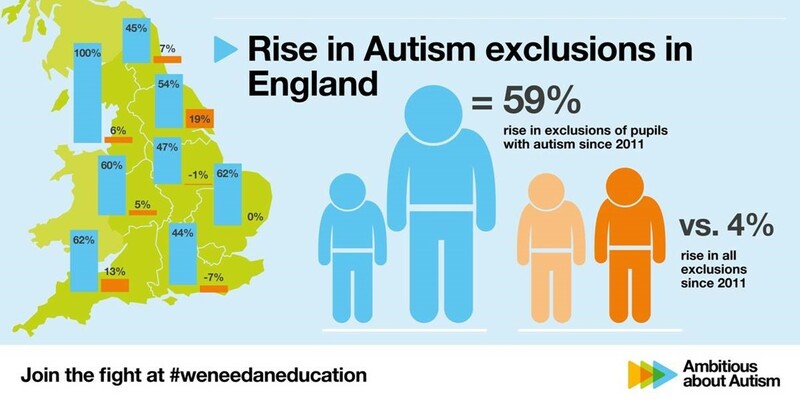 Shockingly, in the last five years, exclusions of pupils with autism have jumped by almost 60%. But exclusions of other children have only risen by 4%. Why is it getting worse for young people with autism? The Government's School Exclusions review must address a school system that has failed children with autism for far too long. Help us to make sure they focus on pupils with autism by sharing our infographics on social media.
" Following his first exclusions, his mum Stacey and the school agreed that he wasn’t coping in a mainstream school and needed to be in a special provision. However, the school later changed its mind. "Billy was subsequently excluded 17 times and then in December the school took the decision to permanently exclude him from school. "Following this decision Billy was left with no education for two months – which had a massive impact on him. During this time he didn’t want to go outside and felt very anxious. He was bored and didn’t have any structure in his life. Also at this time, Stacey was told she couldn’t take Billy out of their house between 9am and 3pm or else she will get fined by the local authority." The increasing exclusion of autistic children isn't right. Join us and demand "we need an education" for autistic children by raising awareness of this issue on social media. You can also read our full report, which breaks down the picture of exclusions region by region, here.